So what is Dastangoi ? 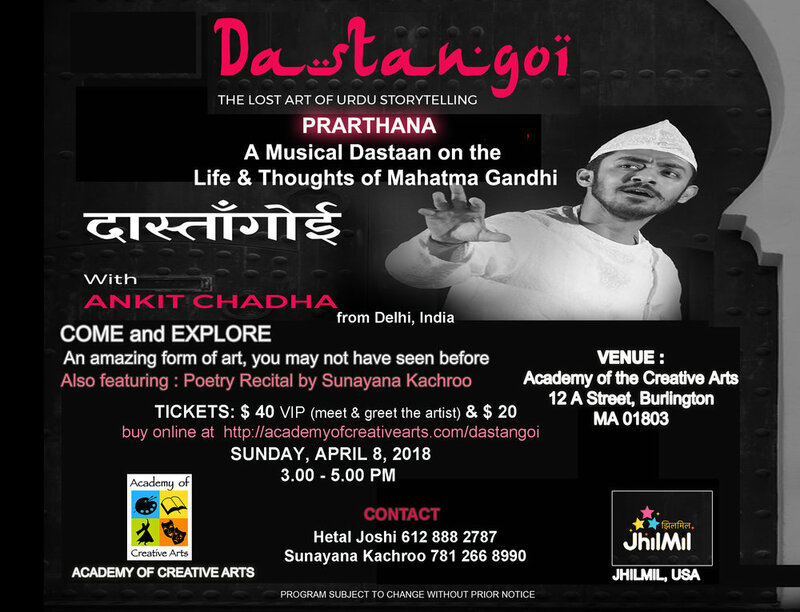 Ankit will be presenting Praarthanaa , a Dastan Celebrating ‘life and thoughts of Mahatma Gandhi’. Praarthana was conceived during Ankit's fellowship at the Sabarmati Ashram. Ankit will also be presenting an entertaining ‘Dastan-e-Khanabadosh’ Did you know that "khanabadosh" means the one who carries his home (khana) on his shoulders (dosh). Like the herder following the herd. Storyteller Ankit Chadha has followed the herders in Gujarat, Uttarakhand and Rajasthan, to bring us their tales of living lightly on this earth. An engrossing tale which Ankit has performed at dozens of places in India and abroad.